Weiβ Schwarz Cards of the Day: 28th of February | TCG, shiyo? We’ve got a Climax combo today, featuring the song ‘Black★Rock Shooter’, but unfortunately with no sign of the accompanying outfit. 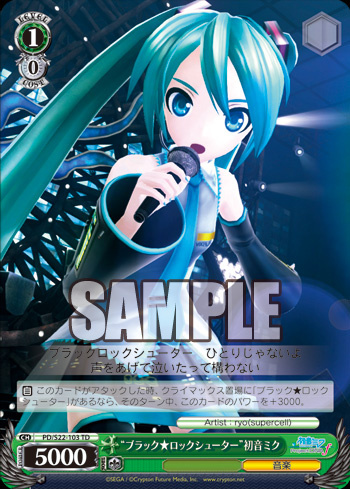 [AUTO] When this card attacks, if [Black★Rock Shooter] is in your Climax Zone, during that turn, this card gains Power +3000. [CONT] All of your characters gain Soul +2. Today Miku shows off her Black★Rock Shooter Climax combo, which could make her quite a heavy hitter without costing you any Stock. 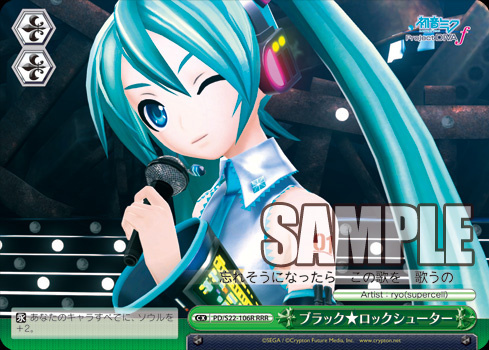 When [Black★Rock Shooter] is played alongside the accompanying Miku, she will become an 8000 Power, 3 Soul card. This means you can take out higher Cost cards, and potentially cause a lot of damage to your opponent. Of course this means that you’ll probably just be trading off your Climax card for one of your opponent’s cards, meaning you’ll need several copies on Stage at once to get the most out of it. The fact she’s a little lacking in power otherwise will likely mean that she won’t be too useful outside of the Climax combo, and is also likely to be defeated on your opponent’s next turn. It’s useful as a way to conserve Stock whilst taking down stronger cards, but it probably won’t do much to shift the balance of resources in a game.